People always ask us if we saved the top tier of our wedding cake to eat on our anniversary. The answer is no. First of all, I (Marilyn) will be out of the country on our first anniversary. Second, and more pertinently, we simply have no space to waste on old cake with Wes's habit of incessantly picking up pounds upon pounds of protein from the market or Costco every time he sees a good deal or an irresistibly beautiful marbled piece of meat, which happens a lot more frequently than you would think. 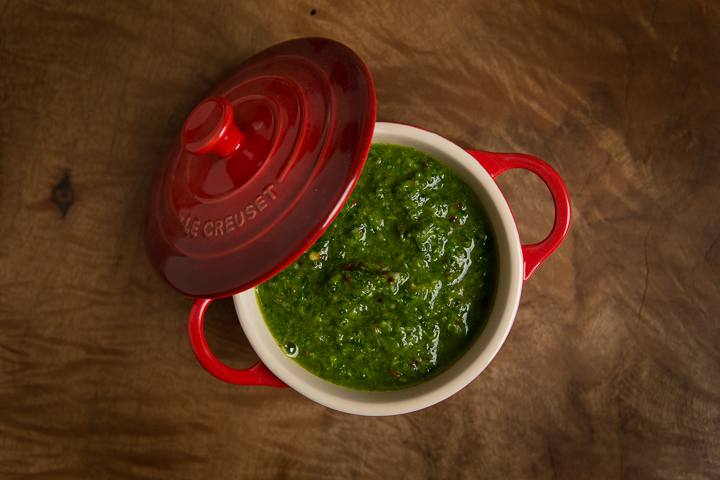 The good thing is, we always have something available to host last-minute dinners or to bring to unforeseen potlucks. 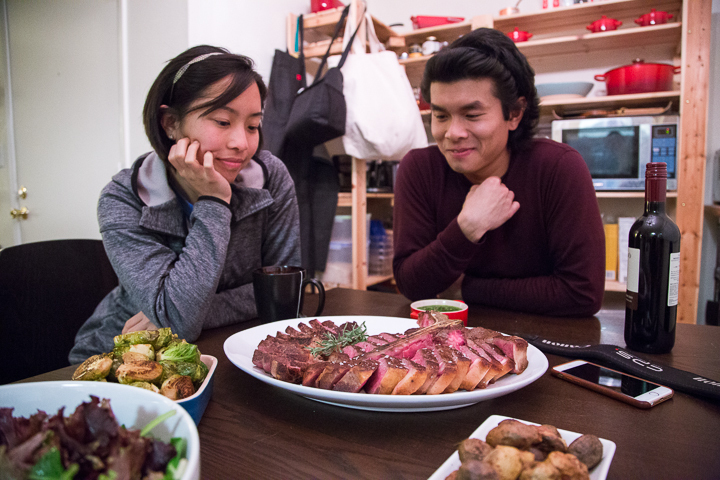 So, when Grace and Thomas came to visit us in Pasadena, we promptly removed one select porterhouse and one prime New York steak from our meat library. We needed to clear space for some fresh loaves of bread from Schat's Bakery anyway, which we were inevitably going to visit during our upcoming trip to Mammoth. 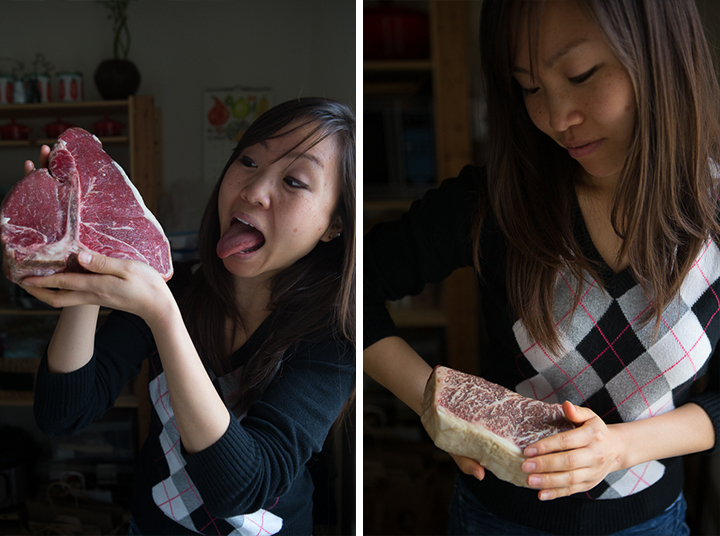 Wes allowed the steak to dry out for just a day in the refrigerator, uncovered. 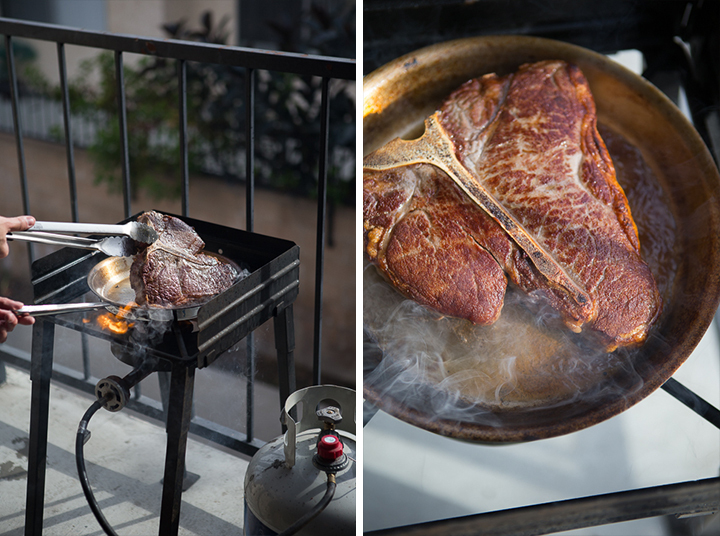 A quick pre-sear on the patio and a 3.5-mile hike at Eaton Canyon later, the steaks were cooked sous-vide to a tender medium rare and ready to be torched and served. 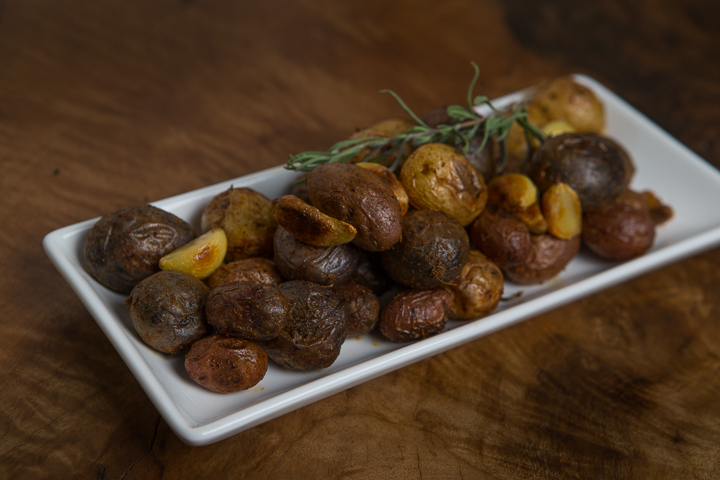 Wes also baked some blistered rainbow potatoes while I whipped up some maple balsamic brussels sprouts and a salad with from-scratch dressing. 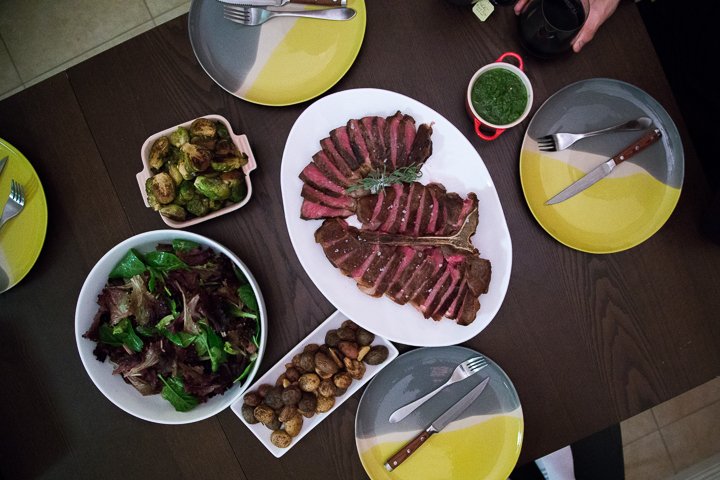 It was a nice, hearty dinner which we didn't have to put all that much thought into. Now, what we did save from our wedding was: wine. Since we were able to bring our own, we overcompensated and ended up with a few extra cases of red, white, and rose--perfect for times like this! We had a bottle of red between the four of us and polished off every last bit of food. It was an ideal ending to a fun day! 1. 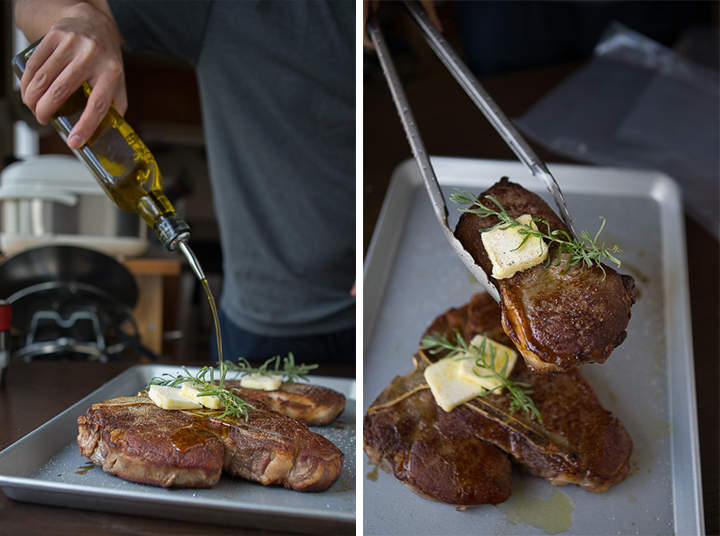 Let lightly salted steak rest unbagged in the refrigerator on a rack for a day to draw out some moisture. 2. 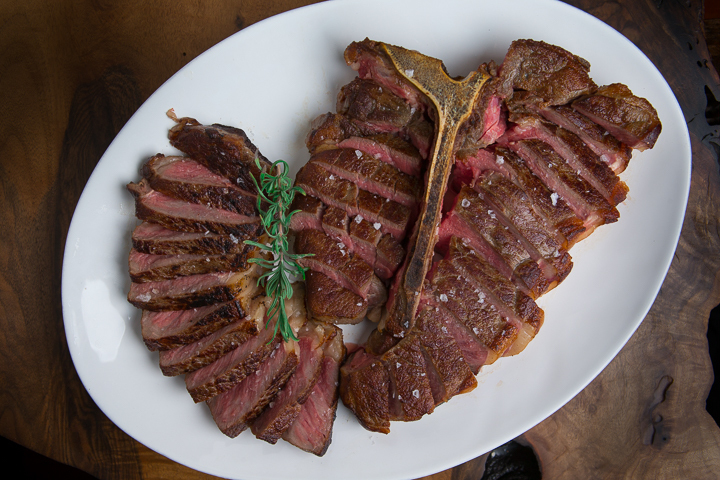 Take it out, pat dry, and lightly salt the steak again. 3. 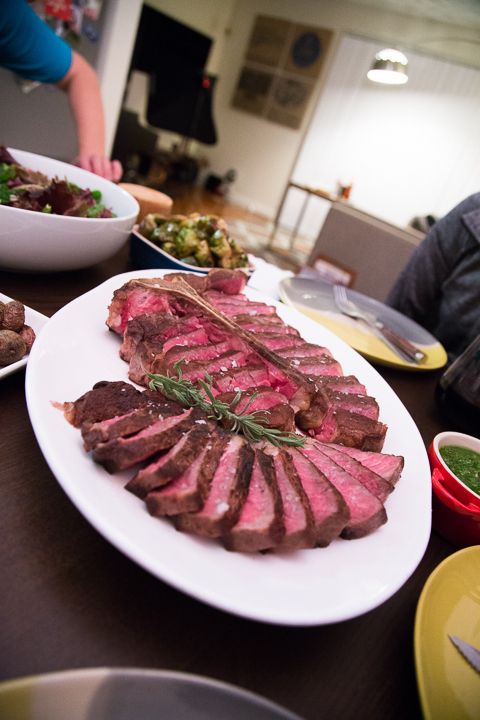 Pre-sear the steak straight out of the fridge (so that it is cold throughout) to brown just the outside. 4. 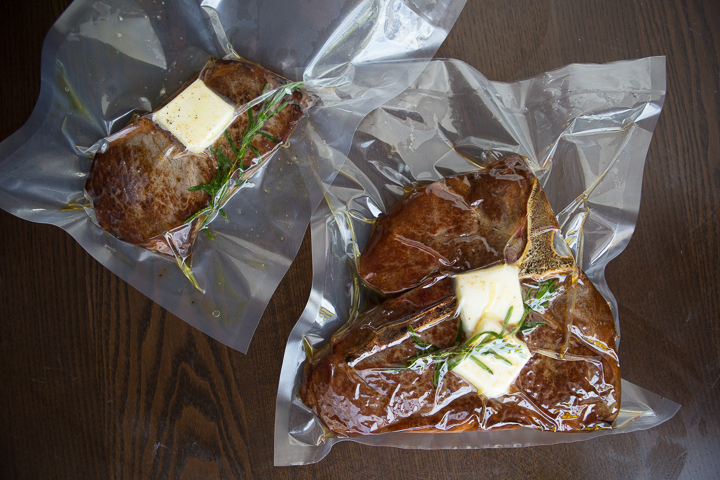 Vacuum seal with a bit of butter and some herbs - went with a sprig of rosemary from the neighbor's garden this time. 5. 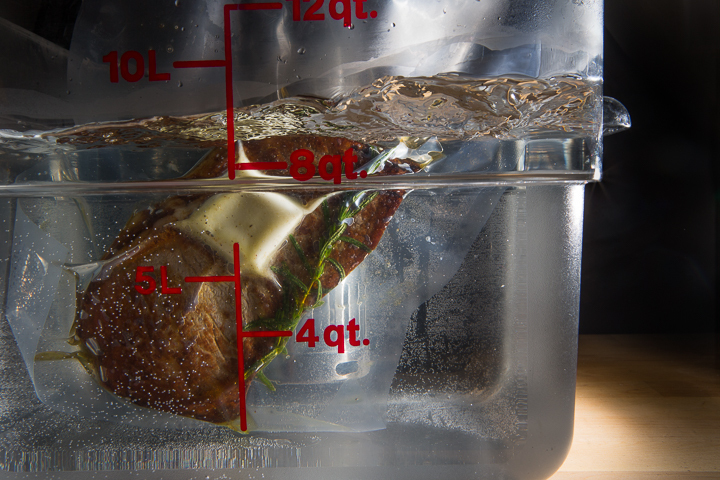 Cook sous-vide (in a water bath) at 125 degrees F for about 3 hours. 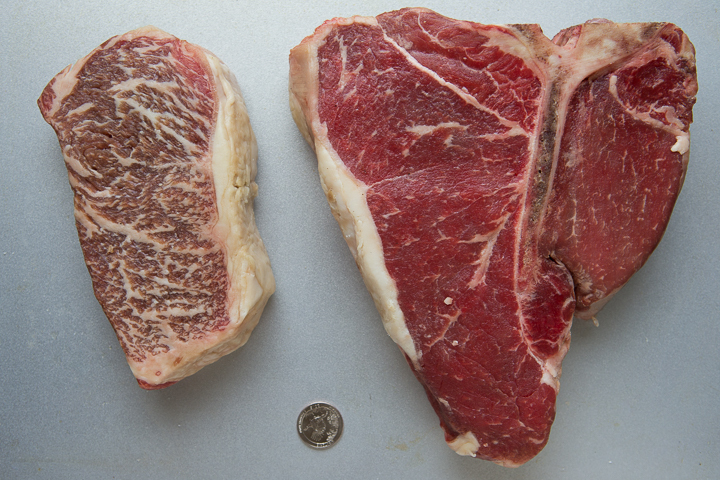 Both cuts of meat were just under 2 inches thick - for smaller cuts, the time does not have to be that long. 6. 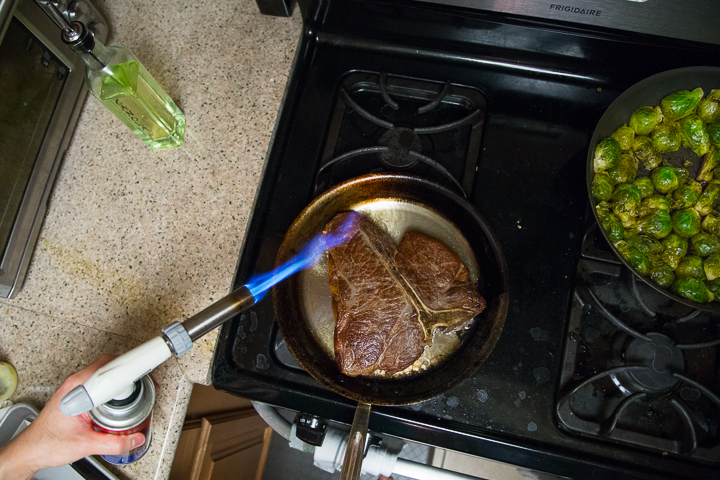 Remove from water bath and pan sear the steak again. 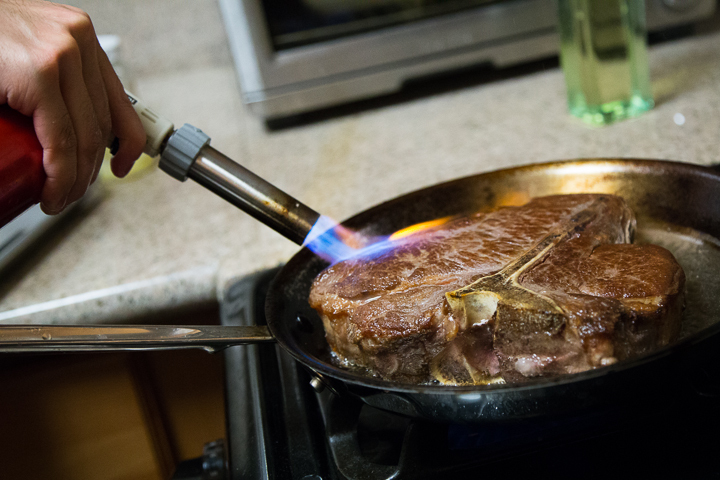 If you have a torch, go crazy on the steak with it! 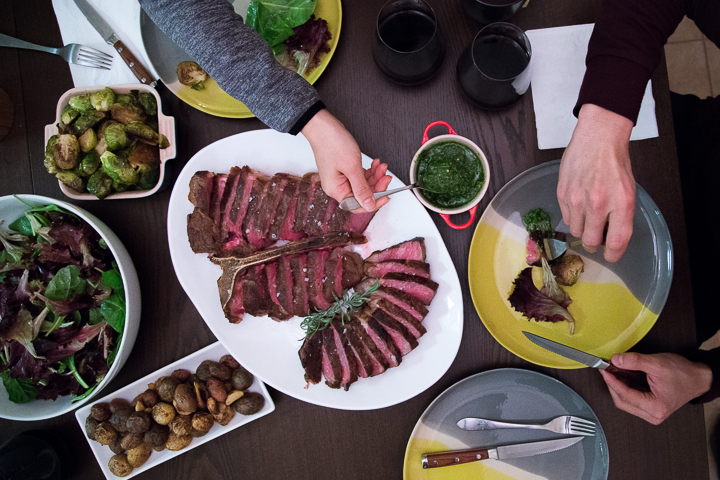 Wes torched it all around and on both sides, focusing on rendering all the fat on the sides. 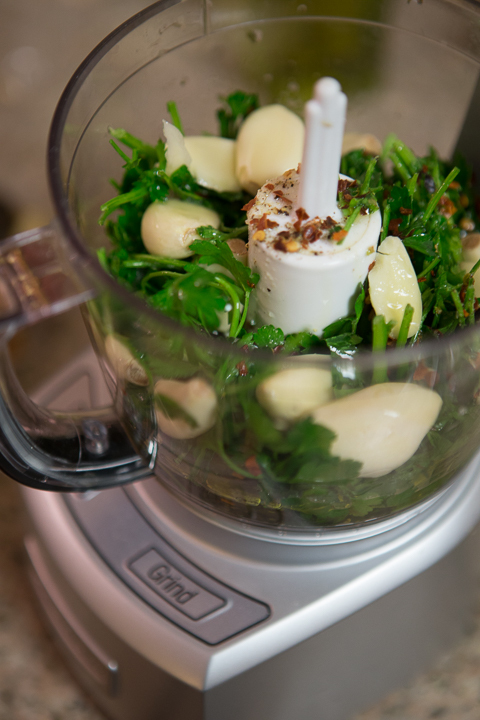 Chop 1 cup of parsley, 1 cup of cilantro, 4 or 5 cloves of garlic, and a pinch of red pepper flakes in a food processor with about 1/2 cup of extra virgin olive oil. 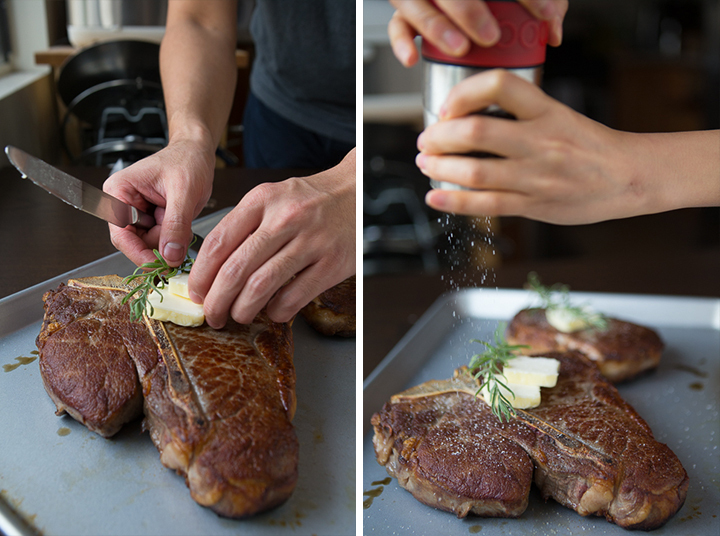 Grind salt and pepper to taste. 1. 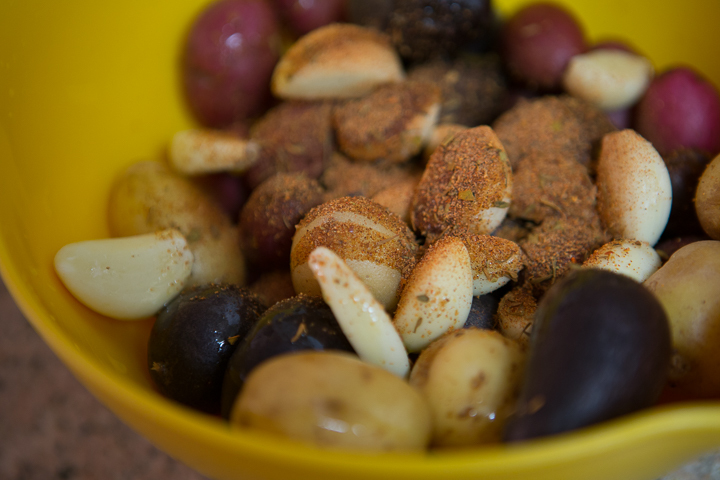 Toss potatoes (and garlic cloves if you like them) in extra virgin olive oil, Emeril's seasoning, and pepper. Pour it out onto a baking sheet. 2. Bake at 400 degrees for about 40 minutes. 1. Toss halved brussels sprouts in extra virgin olive oil, balsamic vinegar, maple syrup, crushed garlic, salt and pepper. 2. 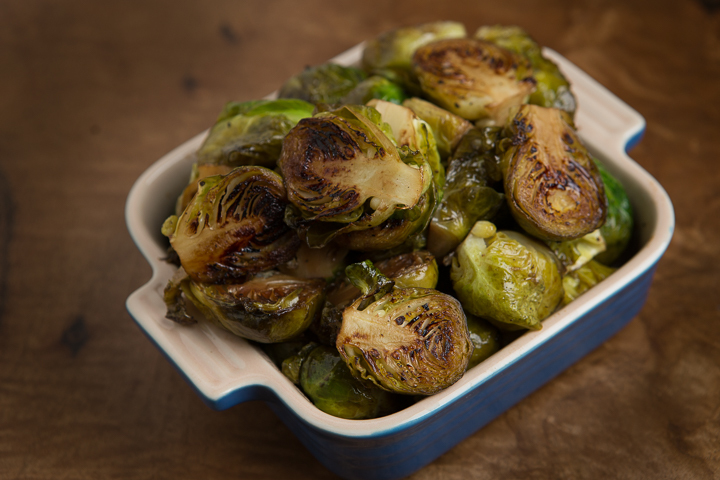 With the stove on high, add brussels sprouts flat-side down on a non-stick pan and cook without stirring until the undersides turn golden brown, about 5-7 minutes. 3. Pour chicken broth (just enough to coat the entire bottom of the pan) in and cover for about 10-15 minutes on reduced heat. I just attended a wedding here and despite my absolutely strict taste, I had an amazing experience here and I thought to myself that these DC wedding venues are perfect! Their food is delicious and the ambiance is elegant.